So yesterday, I looked at how the URL section of a PPC advert can help to increase your campaign’s CTR. Most advertisers will simply use their landing page’s URL as their PPC advert’s URL. However, because you can customize the URL of a PPC advert to your liking, you can optimize it to increase the click through rate. Due to text adverts being extremely quick and easy to make, most advertisers will resort to using just text adverts. However, using image adverts alongside text adverts in your PPC campaign can result in maximizing the performance of your campaign. To start things off, I will look at image adverts from my experience with Google publisher side to Adwords being Adsense. When using Google Adsense, I often experiment between text and image adverts to see which produce the best CPC and CTR for my website. From this experimenting, I came to the following conclusion that image adverts have better CTRs than text adverts. However, image advert’s CPC are lower. Therefore, it’s a win-win situation for publishers. 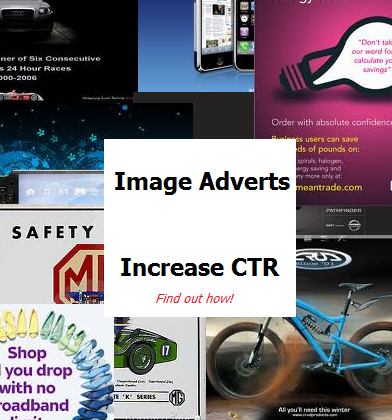 Image adverts will gain you more clicks at a more lower price. For most advertisers that use image adverts, the prime reason they use them is because it gives the advertiser more allocated space to communicate to the web user about the product/service they have on offer. With a text advert, you have three lines: a headline, description and URL. At max this is around 100 characters. Trying to advertise a product or service within 100 characters is a challenging task to say the least. Therefore, an image is the perfect solution. There are no rules on how you should create it. From this freedom image adverts give to advertisers, it helps in communicating their message over to the web user a lot clearer. This is turns will help increase clicks onto the advert. Another benefit that image adverts have over text adverts that will help you increase your CTR is the fact that whatever image advert you create will appear as you created it on the publisher’s website. When you create a text advert, the publisher has the control to change the size of the font, the type of advertising box it is in, the colour and the size too. This produces external factors that may be causing your text advert’s CTR to decrease. With image advert, you will have the security of knowing whatever you create will appear exactly as it should on publisher websites. To finish off this article, I will talk about an article I made on image adverts entitled, ‘[How to] Make an Advert Not Look Like an Advert‘. If you do wish to include image adverts in your campaign, you may find that giving it a professional look will reduce your CTR. An experiment was made between two image adverts: one of them was created professional with the other created in Microsoft paint. Placed in identical campaigns, the Microsoft paint image advert gained a CTR of more than double that of the professional advert. This makes clear that if you do create image adverts, experiment! Sometimes, the simpler the ad is, the better it performs.